I’ve devoted only one of 645 posts to a television show, Longmire, because the series is exceptional. Walt Longmire, a rural Wyoming sherif, is haunted by his wife’s murder. Each week we see him try to keep peace with his own demons, with his daughter, his employees, and the neighboring Cheyenne reservation, while solving crimes and capturing desperadoes. Though the show has a solid viewer base, A&E cancelled the series two weeks ago. 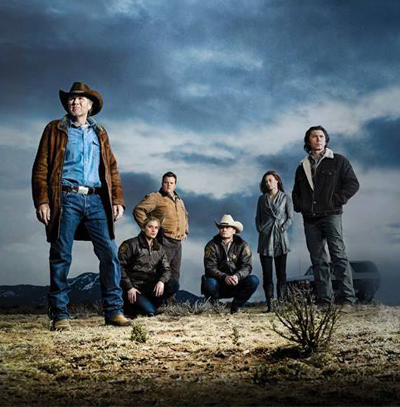 TV Guide reports that Longmire viewers are too far over the hill. With an average age of 61, apparently we don’t by as much stuff as the sought-after 19-49 year old demographic. All may not be lost. As one of the top 25 television shows of the summer, Warner Brothers is putting together a presentation to other cable networks to continue with a fourth season for Longmire. I hope they succeed so I don’t have to spend my “golden years” recalling the good old days when television was occasionally intelligent. This entry was posted in Culture, Entertainment, Television and tagged 2014, Culture, entertainment, Longmire, postaweek2014, Television. Bookmark the permalink. 4 Responses to The end of Longmire? I started watching Longmire because of your post. Love the show! I hate that it was cancelled. Maybe they will save it yet. Hope so. I hope so too, and I think it has happened before. Filmed in New Mexico apparently! Interesting. Didn’t realize but I can certainly see that.